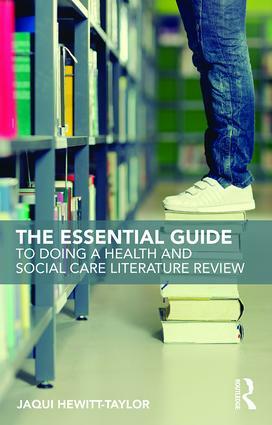 This step-by-step guide takes the reader logically through the process of undertaking a literature review, from determining when this methodology might be useful, through to publishing the findings. It is designed particularly for students undertaking a dissertation using literature review methodology. However, it also caters to practitioners who wish to review the existing evidence in order to develop practice. advice on the dissemination of findings. Written by an established author with significant experience teaching and supervising students doing literature reviews, this invaluable text offers systematic and insightful advice on all aspects of literature review methodology, from problem identification to synthesizing information to forming conclusions. It is ideal for any student or practitioner in health and social care looking to undertake a literature review for study or practice purposes. Jaqui Hewitt-Taylor is a Senior Lecturer in Practice Development at the Faculty of Health and Social Sciences at Bournemouth University, UK. She has a wealth of experience teaching in research and offering support as a tutor and supervisor for dissertations at undergraduate and postgraduate levels. Her most recent books are Developing Person-Centred Practice (2015) and Managing Change in Healthcare: A Step by Step Guide (2013).